Email is the standard way of sending files across the Internet. However email wasn’t designed for file transfer, and limits the size of files and attachments that can be sent. This limit varies but is 25MB for Yahoo Mail. Dropbox is a file hosting and file sharing service that can be used for transferring large files across the Internet. Note: Dropbox can be used with or without email. Yahoo Mail integrates with Dropbox, and allows you to attach files from your Dropbox storage space or your PC, and send them by email to any email address. The file should already be stored on Dropbox. The ability to upload files from Yahoo mail to Dropbox as part of the attachment process seems to have been removed. 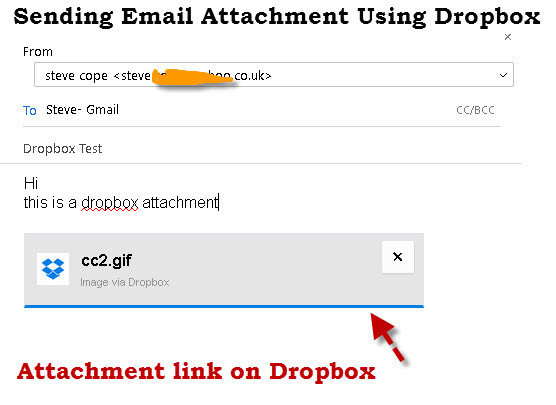 When sending files/attachments using Dropbox it is important to realise that only a link to the file is sent in the email, and not the file itself. 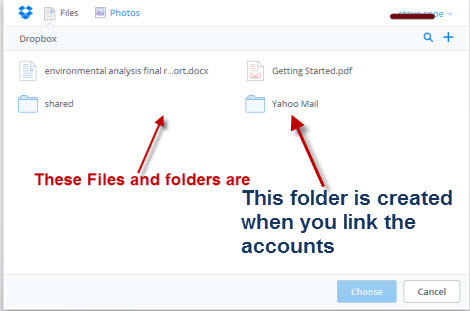 You compose an email message in Yahoo as normal, and to attach a Dropbox file click on the attachment icon at the bottom on the message window. Select the Share files from cloud providers option. From the cloud storage options on the right click Dropbox. 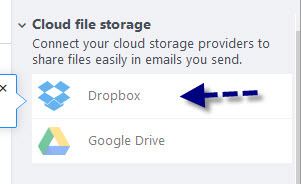 If this is the first time of using Dropbox you will prompted to link your Yahoo Email account to your Dropbox account or to to create a new Dropbox account. Once you have a Dropbox account you can link the two accounts so that you don’t have to login twice when using Dropbox from Yahoo. 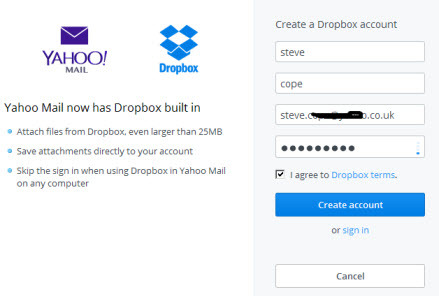 Now the Dropbox and Yahoo accounts are linked you can add files directly from Your Dropbox account, and even upload new files to Dropbox. 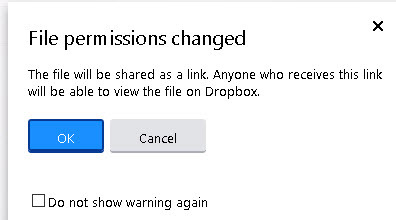 If you now click on the share from Dropbox link a window opens to show you the files on Dropbox. Select the file/files you want to attach and you will get a warning box warning you that anyone can use the link to view the attachment. Click OK and the attachment is added to the email as a link. When The recipient receives the email. The email attachment appears as a link and they must click the link and download the file to their computer. Here is a video I created showing how to attach files from Dropbox and upload files to Dropbox, It also shows you what the email recipient sees. A- Yes they have a free basic account option with 2GB of storage. Q- How to I Upload files to Dropbox? A- In older versions of Yahoo mail you could upload files to Dropbox as part of the attachment process. This feature seems to have been removed and now you will need to login to Dropbox and use the Dropbox control panel to upload files. Q- Does the recipient need a Dropbox account to read the attachment? Q- Why not just send the files the usual way? A- The main reason is attachment size limits that are imposed on email- usually 25MB. Q- When I use Dropbox Is the attachment/files stored with the email in the recipients email account? A- No it isn’t only a link to the attachment is stored. This link may become invalid in the future so the the recipient should download the attachment if they want to keep it. Q- If I stop using Dropbox can I unlink the accounts? Q- Should I send all file attachments using Dropbox? A- No it is usually only used for large files. A- Yes, but they don’t appear in your Yahoo sent items. 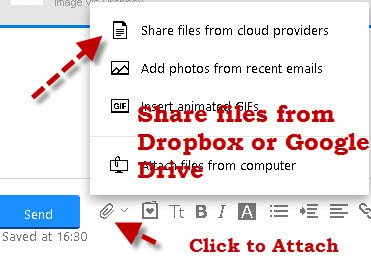 Q- Are Email Attachments that I receive automatically stored in Dropbox? A- No They are stored in your email mailbox. Q- Can I email files to Dropbox? Yahoo mail integrates with Dropbox to allow you to easily send large file attachments across the Internet. 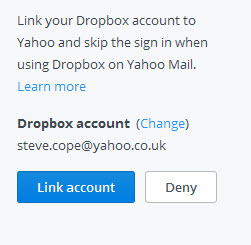 Once you have linked your Yahoo mail account to your Dropbox account you don’t need to login to both accounts. The email recipient doesn’t need to have their own Dropbox account in order to receive the files. 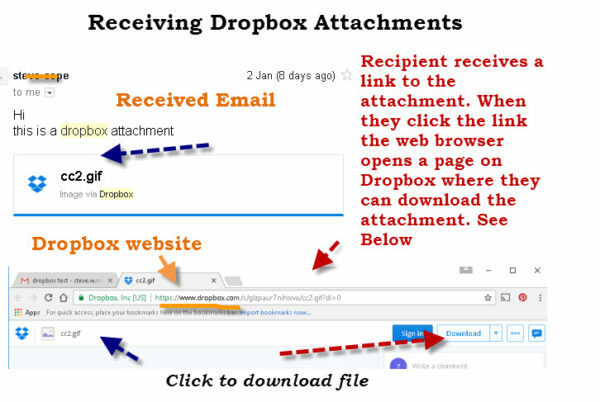 Attachments that you receive are still stored as part of your normal email and not in Dropbox.